How does plastic litter end up in the sea? How much microplastic does our shower scrub contain? Where exactly is the plastic waste in the ocean? What do our rivers have to do with it? And how can I, as an individual living far away from the coast, participate in real research on seas and oceans? These and other questions will be answered in a webinar for teachers and youth group leaders under the title Sustainable environmental education in schools: Plastic waste in German rivers – the "Plastic Pirates" campaign on 13 September 2018 at 5 pm. Registrations are welcome. 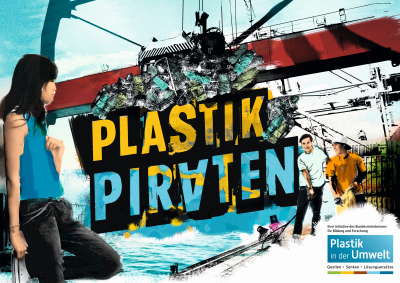 In addition to experiments on chemical properties and the behaviour of macro- and microplastics in water, speakers from Kieler Forschungswerkstatt and Ecologic Institute will present the project "Plastic Pirates”, a German citizen science project for students aged 10 to 16, coordinated by Ecologic Institute. The Plastic Pirates will enter the fourth round of sampling from 15 September to 15 November 2018. They are funded by the German Federal Ministry of Education and Research within the research focus "Plastics in the Environment" and are contributing to research on the distribution of macro- and microplastics in and around German rivers.